The clinic has been purpose built and equipped in order to establish a high quality, modern Family Practice, so that our health care professionals can focus on caring for their patients. Dr Alison Richards graduated from the Royal Free Hospital London UK in 2000. She is a Fellow of the Royal Australian College of General Practitioners and has a postgraduate Diploma of Child Health. Alison is an experienced GP who has a special interest in in women’s health, children’s health, mental health, sexual health and chronic disease management. Alison is passionate about good quality care and provides comprehensive evidence based patient centred care whilst maintaining a holistic approach. Dr Richards is available to see new and existing patients of the practice. 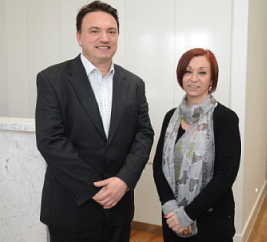 Dr Jo-Anne Zappia is a highly experienced general practitioner at Armstrong Street Medical Centre. Dr Zappia graduated from the University of Adelaide Medical School in 1993. After completing her hospital rotations, which included paediatrics, obstetrics and palliative care, she entered general practice and has worked as a GP since 1995. Jo-Anne worked initially in Adelaide and moved to Melbourne in 2000. She is a Fellow of the Royal Australian College of General Practitioners and has a postgraduate Diploma in Obstetrics from the Royal Australian College of Obstetricians and Gynaecologists and a Certificate in Clinical Hypnosis from the College of Medical Hypnosis. Jo-Anne has a special interest in fertility, pregnancy, lactation and babies. She also enjoys the full breadth of general practice from newborn to old age, particularly enjoying the privilege of getting to know people and their families. As well as practising medicine, Jo-Anne enjoys tutoring international medical graduates and acting as an examiner for the Royal Australian College of General Practitioners. Dr Jonathan David graduated in 2003 from the University of Manchester in the UK. He has been exposed to a wide variety of medical specialties throughout his training and taken particular interest in General Medicine, Paediatrics, Anaesthetics and Acute Medicine. Along the way he attained Membership of the Royal College of Physicians (UK), Royal College of GPs (UK, then Australian Fellowship), completed the Diploma in Child Health (UK) and became accredited as a GP Anaesthetist. He has been working in General Practice since 2009. Dr Leon graduated from the University of Queensland in 1991. He has over 10 years’ experience working in both Public and Private Emergency Departments. He has a postgraduate Certificate in Primary Care Skin Cancer Medicine from the University of Queensland, and a Diploma in Obstetrics from the Royal Australian College of Obstetricians and Gynaecologists. Dr Leon has an interest in all aspects of general practice. He has particular interest in Family Medicine, Paediatrics, Women’s Health, Men’s Health, Travel Medicine, Skin Cancer Checks, Varicose Veins, Sports Medicine and Preventive Care. Dr Kate Cain BCom, MPsych(ClinPsych), PhD Melb. Kate Cain trained as a psychologist at the University of Melbourne and is committed to helping people understand and manage the issues and concerns that can affect their mental health. Her objective is to help people maintain their psychological well-being in order to live a better life. Kate has helped clients with a range of mental health issues including anxiety, depression, obsessive compulsive disorder, panic attacks, eating disorders, and substance use, and has a special interest in relationship counselling. She has also run workshops on mindfulness meditation. Prior to commencing work as a psychologist, Kate worked for major corporations for a number of years, before developing and managing her own business. Her career history adds a further richness to her life experience and the understanding she brings to her work with her clients. Dalija Jovanovic is a Dietitian and Sports Dietitian who is available to see patients. Dalija graduated from Griffith University in 2013 with a Masters in Nutrition and Dietetics. She has a postgraduate Certificate in Diabetes Education, Sports Nutrition and ISAK Level 1 Anthropometry. Dalija has experience working in both hospitals and private practice. Dalija has an interest in all aspects of health and nutrition. She has particular interest in weight loss, food intolerances, sports nutrition, diabetes and nutrition in pregnancy. Dalija stays up to date with the latest in medical research and continues her passion for sports and nutrition as a practicing dietitian. She works with an extensive list of clients that vary from busy working professionals to professional athletes. Since then Nader has developed a passion for the management of sports related injuries in athletes and active people as well as treating patients suffering with Diabetes. In his time working as a podiatrist Nader established himself as a podiatry mentor, assisting and training new graduate podiatrists in their first year of podiatric practice. He looks to the ever evolving field of Sports Podiatry and is able to construct customized biomechanical treatment plans for his patients. He has attained a post graduate certificate in dry needle therapy and orthotic prescription and has experienced both public and private podiatry settings. In his spare time you will find Nader doing small projects around the house and spending time with his wife. He’s an avid soccer fan and is involved with his local church community. Our dedicated and experienced practice nurses have an interest in all aspects of nursing and are enthusiastic members of our team. Our receptionists have wide experience in General Practice, and provide both their expertise and a friendly caring attitude to Armstrong Street Medical Centre. Pathology testing is performed by Australian Clinical Laboratories (formerly Healthscope) on site Monday, Tuesday and Thursday between 8 am and 12 midday, and now on Saturdays 9am to 1pm subject to availability. This service is on a walk in basis. When presenting for a pathology test please report to the front reception to advise them of your arrival. If you are a doctor, practice nurse, therapist or a medical receptionist interested in employment at Armstrong Street Medical Centre, please forward you resume to the Recruitment Manager at 50 Armstrong Street Middle Park Victoria 3206 or contact us on 9699 4333.